March from Black Box Theatre to Boots-to-Books Monument at Edmonds Community College. Photo courtesy of ECC Veterans Resource Center. Memorial Day at Edmonds Community College (ECC) is celebrated on the Wednesday before the national holiday, which is always held on the last Monday of May. And so we gathered on 23 May at the Black Box Theatre for ECC’s Fifth Annual Ceremony—a time to remember those who died while in military service to our country. The event is sponsored by the ECC Veterans Resource Center, led by Chris Szarek, Director. Please see http://www.edcc.edu/veterans. Three musicians performed solos: Toby Beard, bagpiper; Peter Ali, Native American flutist; and me. I sounded two bugle calls on my Getzen bugle: “To the Color” and “Taps.” Peter ad-libbed during the slide show inside the theatre and outside at Boots-to-Books Monument. Toby called the event to order in the theatre with a tune to open the program; played another tune while leading the march from the theatre to the monument; and finally played “Amazing Grace” at the monument. The colors were presented by the U.S. Joint Volunteer Service Command Color Guard. “Count your blessings, name them one by one,” goes the hymn written by Johnson Oatman, Jr. 121 years ago in 1897. 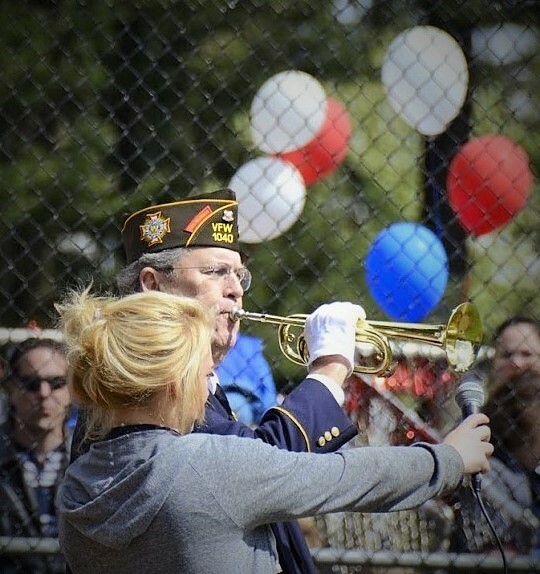 Well, here’s one of mine: I got to sound the bugle call, “To the Color,” for the 7th straight year at Pacific Little League Day at Lynndale Park in Lynnwood on 21 April. I used my Getzen bugle, of course…love it! Five kids from Girl Scout Troops 44193 and 40919, along three Boy Scouts and one Cub Scout, formed the Color Guard. Here’s another blessing: three photographers shared their photos with me for this blog post, enabling me to present this Photo Gallery of the event. Please click on any photo to enlarge it. How speedy is your fastball? Kyle Gaul, piper, leads the procession across the Edmonds Community College campus. On 24 May at Edmonds Community College (ECC), veterans, their relatives and friends, and college officials and students gathered at the Black Box Theatre on campus for the 4th Annual Memorial Day Ceremony. The event is sponsored by the Veterans Resource Center at ECC, headed by Chris Szarek, Director, USN (Ret). 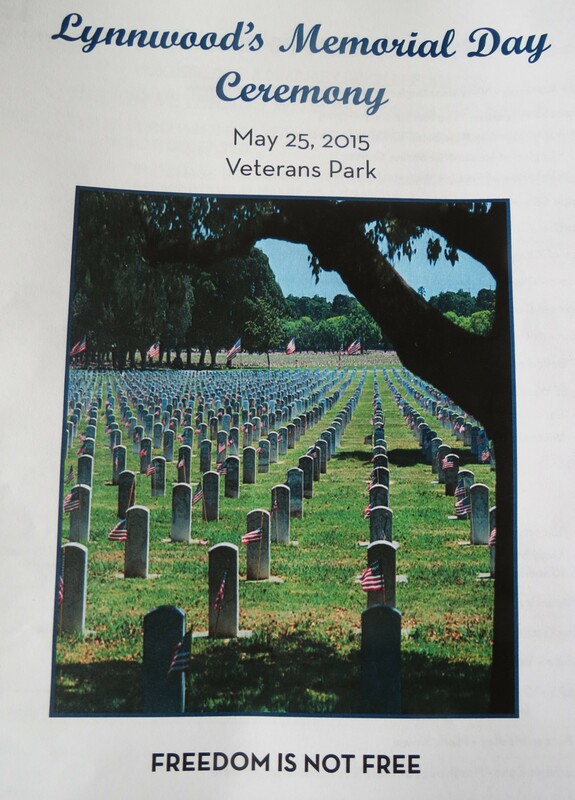 The Guest of Honor and featured speaker was Shannon Sessions, Air Force Veteran and Lynnwood City Council member. After this portion of the indoor ceremony, the group processed to the nearby Boots-to-Books-and-Beyond Monument for the public wreath-laying ceremony. I had the privilege to sound two bugle calls, “To the Color” and “Taps,” on my Getzen Field Trumpet. Other performing musicians were Native American flautist, Peter Ali, and bagpiper, Kyle Gaul. All photos are by Nathan MacDonald, courtesy of the Veterans Resource Center. On the left, Buck Weaver (90+), WWII Veteran, leads the audience in singing, “God Bless America.” On the right is the Color Guard, VFW Post 1040, near the Boots-to-Books-and-Beyond Monument. Please click on either photo to enlarge it. Glenn Ledbetter, VFW Post 1040 Bugler, rehearses the presentation of the colors with members of Girl Scout Troop 44193. Photo courtesy of MyEdmondsNews.com. Here comes Spring, and I start watching the calendar more closely. Here comes April. Here comes Baseball. Here comes Pacific Little League Day. Here comes my sixth annual opportunity to sound the bugle call, “To the Color,” as I stand in front of home plate at Harry H. Moore Field at Lynndale Park in Lynnwood, Washington. I tell you, it’s such an honor. I love it. And I love playing my beautiful Getzen Field Trumpet (bugle). This year, the Color Guard was composed of kids from Girl Scout Troop #44193 and Boy Scout Troop #331. It was the same this year but not the same. Same national holiday, same place, same participating organizations, same order of events, etc. 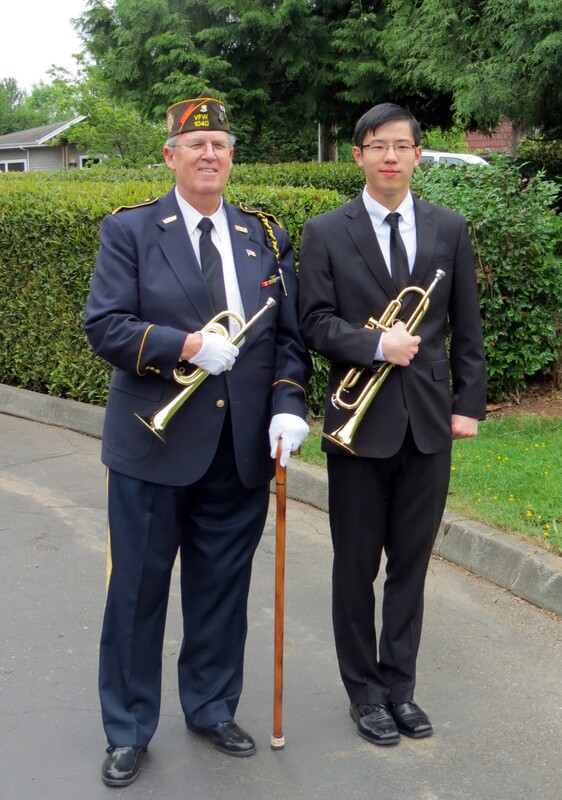 But when it came to sounding “Echo Taps,” this was the first time that one of my trumpet students, Robert, was ending his senior year in high school and planning to attend college in the fall. Farewell to Inglemoor High School in Kenmore and hello to Washington State University in Pullman–a big leap for a young man! This is the second time he sounded “Echo Taps” with me at this place–please see my post of 19 June 2014. For more about Memorial Day, please see my posts of 18 August 2015, 1 June 2013, 2 June 2012, and 3 June 2011 in the Archives (left). All photos by Nancy MacDonald unless otherwise marked. Please click on any photo to enlarge it. Glenn Ledbetter, “Echo Taps,” 5-25-’15. Photo by Janelle Squires. Is there a future Seattle Mariners baseball star in the Pacific Little League? The huge crowd in Lynnwood on 25 April 2015, might reasonably hope so, given the exceptionally strong performance of its All-Stars last year when they played in the Little League World Series in Williamsport, Pennsylvania. 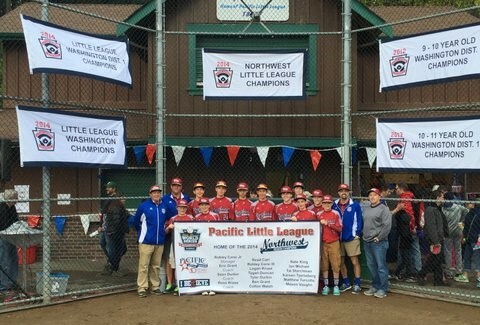 Celebration of their significant accomplishment highlighted this year’s Pacific Little League Day. And for the fourth year in a row, I was privileged to participate by sounding “To The Color,” this time on my new Getzen bugle, while Girl Scout Troop #44193 presented the colors to the hundreds of players and their fans at Harry H. Moore Field, Lynndale Park. Every season opening is filled with excitement and hope, for “every day is a new day, with no mistakes in it,” as Anne of Green Gables says in the movie. For more information about and photos of the very special Pacific Little League, this venue, and this annual event, see my previous blog posts of 22 May 2012, 26 May 2013, and 7 June 2014. Unless otherwise identified, these photos are by Carol Sheldon, Michelle Corsi, and Nancy MacDonald. Please click on any photo to enlarge it. Glenn Ledbetter organizes Girl Scout Color Guard before ceremony begins. Photo by David Pan, Editor, Lynnwood Today.